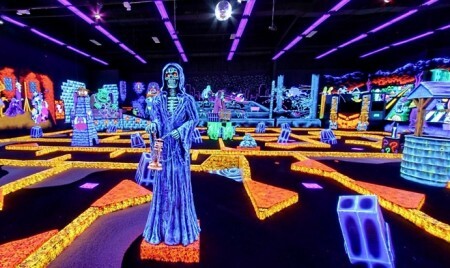 Monster Mini Golf is an indoor, climate-controlled facility, which features black lights, monster-themed décor, 18-hole miniature golf course, and more. Promotional value expires 90 days after purchase. Amount paid never expires. Reservation recommended. Not valid for organized group events of more than 10. May redeem across visits. Limit 1 per person, may buy 1 additional as gift(s). May be repurchased every 90 days. Valid only at listed locations. Merchant is solely responsible to purchasers for the care and quality of the advertised goods and services. Monster Mini Golf welcomes guests of all ages with 18 holes of spooky, glow-in-the-dark fun. Fog machines, colorful lasers, and special effects lighting surround the custom-designed indoor course. Meanwhile, an energetic soundtrack of 70s, 80s, and 90s party music keeps spirits high as the visitors conquer each hole’s monster-themed obstacles and hazards. In between songs, the course DJ pumps up the crowds with interactive games and trivia questions, rewarding lucky winners with take-home prizes. Groups of family and friends can visit Monster Mini Golf’s arcade and play on the glowing air hockey tables, skee ball machines, and other games.